In 1951, Balkrishna Doshi attended the International Congress of Modern Architecture in Hoddesdon, England. The 24-year-old architect was the only Indian there. He was besieged with questions about Chandigarh, the planned new capital city of Punjab. At Hoddesdon, Doshi sought employment with Le Corbusier. Le Corbusier was chosen as lead architect of Chandigarh by Jawaharlal Nehru, then Prime Minister of India. Doshi was promptly dispatched to Corb’s atelier in Paris. Speaking no French, and receiving no pay for the first eight months, Doshi survived on a diet of bread, olives and cheese. For the next four years, he would work on Le Corbusier’s most important Indian projects: the High Court and Governor’s Palace in Chandigarh (the latter unbuilt), and the Shodhan House and Villa Sarabhai, and the Mill Owners’ Association (MOA) Building in Ahmedabad. 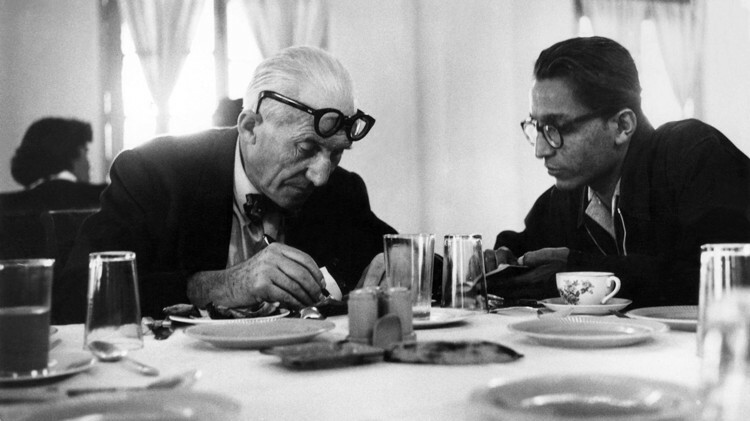 Doshi was quickly designated by Le Corbusier as the atelier’s principal interlocutor between Paris and India. In 1955, Doshi returned to India to oversee the completion of several projects there, and started his own firm in 1956. His pivotal role in the Mill Owners’ Association project–probably the last direct link between the Pritzker laureate and Le Corbusier–is worth a close look as we celebrate Doshi’s legacy. After World War II, Le Corbusier was seeking to move beyond the International Style by bringing in elements of traditional architecture, yet avoiding nostalgia. Doshi remained a key elaborator of this fusion. In his own projects, in his own words, he builds not on the literal elements but rather on the spirit of Corb, “expressed in proportions, modulations of space, creation of rhythms and tonalities.” However, in the early fifties, Doshi was not yet at a stage where he could operate independently of the western, modernist canon and pursue his own more overtly Indian architecture. He needed to please the Mill Owners Association, who wanted the Le Corbusier “brand” on every aspect of the project, including the furniture. Doshi needed also to meet Le Corbusier’s exacting standards, describing the building as a “little palace… an architecture for modern times adjusted to the climate of India… a true message toward an Indian architecture.” Disputes between the client and Le Corbusier created an opening for Doshi to design the building’s furniture himself. It was in harmony with the little Indian palace, but would not have been out of place in Saint-Germain showrooms like Steph Simon, next to designs by Charlotte Perriand, Pierre Jeanneret, and Jean Prouvé. The archives of the Le Corbusier Foundation house hundreds of pages of letters, sketches, and plans relating to the stormy interactions around the design and construction of the Mill Owners’ Association. Money issues dominated the process well before the design phase even began. Le Corbusier even requested Nehru’s personal intervention on the issue of the double taxation of his income in India and France. Money conflicts were so acrimonious that for a period of several months Le Corbusier did not communicate directly with his client. This paved the way for more involvement by Doshi. Thus Doshi was anointed as the fulcrum between east and west. In a series of letters to him, Jean-Louis Véret, a French architect who also worked for the atelier, raised several questions from the worksite, exhorting him facetiously to “show us the efficiency of the new India.” Doshi responded – in excellent French for someone who didn’t speak it at all in 1951 – with detailed sketches and descriptions. Doshi relished being in the control tower at rue de Sevres while Véret sweated it out on the frontiers of modern architecture. In Véret’s direct correspondence with Le Corbusier, most punch list items were marked “Doshi” in Corb’s hand. Doshi’s access to the Old Man was taken for granted by his colleagues. A frustrated Véret berated Doshi for being unresponsive once construction was underway: “you don’t have the excuse of having to wait to see Corbu,” he wrote. In mid-1954, Le Corbusier resumed direct contact with the MOA officials about finishing details of the building, including the touchy subject of the furniture. Having harangued and bickered with their architect about the carpeting, the width of the entry to the toilets and other details, the tenacious MOA president asserted that they were owed original designs for the entirety of the furniture. Le Corbusier, through an underling, suggested Mira Sarabhai (of the prominent family which commissioned a private house in Ahmedabad) to obtain some brochures from the U.S. or England and pick the furniture “in the spirit of the building.” With the construction phase drawing to a close, each side staked out irreconcilable positions on the finishes. The client wanted the architect’s brand on not only the building but also its contents, and the architect told the client to go buy them off the showroom floor! Abroad, no less. Doshi arrived in India to replace Véret in January 1955. Véret wrote: “This is great news because at least the building will be finished correctly.” Several months later, however, the subject of the furniture was still not resolved. Meanwhile, the end of the construction phase failed to bring with it an improvement in relations between Le Corbusier and his clients. Le Corbusier was fed up, and the feeling was mutual. The resolution of this impasse fell to the recently repatriated Doshi. He authoritatively advised the MOA that “for the last few minor details pending I have already given complete instructions…” At this point the archive trails off, confirming that Doshi handled it himself. The final plans for the project, as published in Le Corbusier: Oeuvres complète 1957-1965, show close approximations of actual furnishings. Doshi’s fixed concrete table, a massive freeform conference table, and a second conference table in the shape of an “A” are recognizable in the plans signed by Le Corbusier. We know that prototype chairs came from Chandigarh, produced under the aegis of Pierre Jeanneret. The rest of the furniture, including stools, cabinets, and desks, was designed by Doshi and executed under his supervision in Ahmedabad. Two preceding generations of Doshi’s family had been in the furniture business, so he knew what he was doing. With four years in Paris under his belt giving him the confidence to assert himself, Doshi broke the logjam by telling the Ahmedabad contingent that he had been, in effect, anointed by Le Corbusier to make the furniture. Perhaps he even pointed out to them that it was standard operating procedure at rue de Sevres for someone else in the atelier to design, or at least work out, the furniture, as Perriand and Jeanneret had done for several Corb villas. Doshi would go on to father a new Indian modernism that melded late Corbusian precepts with Indian traditions and concerns. He would be responsible for bringing Louis Kahn to Ahmedabad a decade later. The Mill Owners’ Association was his first trial by fire on his way to assuming his pivotal role in the history of architecture.